When adding or replacing a computer in your shop, you probably want to be able to use Ascend on it. Luckily, we've made it easy for you to set up Ascend on your new workstation! 1. Go to the Network and Sharing Center on your computer. 2. Select Change advanced sharing settings. 3. Expand the Private section. a. Check Turn on network discovery. b. Check Turn on file and printer sharing. 4. Expand the All Networks section. a. Check turn off password protected sharing. Select the folder icon on your computer's taskbar. Click Network on the left. Under Computers, you should see the names for your other computers appear. 1. Go to our website, AscendRMS.com, and log in. 2. In the Retailer Portal, select the Downloads icon for your country (for example, US Downloads). 3. Under Ascend, click the newest version of the Ascend Client (for example, Ascend Client Spring 2017). 4. The file downloads to your computer. The downloaded file might be visible along the bottom of your browser window, or it may appear in a pop-up asking you to run it. If you're not sure where it is, go to your Downloads folder and find it there. 5. Select the file. You may be asked if you want to run it. Click yes. 6. Follow the Ascend install prompts to add Ascend to this computer. Once it's installed, you should be able to select the Ascend program. When the program opens, it will notify you that it is not connected to the server. 1. Get the name of the server computer. You might recognize it in the Network folder on your workstation. a. Otherwise, go the server computer. c. Type system and select System from the results. d. Under the section Computer, domain, and workgroup settings, you'll see computer name with the server's name next to it. 2. Go back to the new computer. 3. In Ascend on the new workstation, select Show Servers. 5. Type in the server computer's name. Ascend will search for, and hopefully connect to, the server computer in your shop. If it is not able to find the server by name, call the Ascend Support Team. Your computer may need to be connected using the server's IP Address, or there might be a networking issue on the new workstation. It's important to assign a name to each workstation in your shop so that they can be easily identified on reports, workstation specific options can be configured, and you can easily cash out your registers at the end of the day. 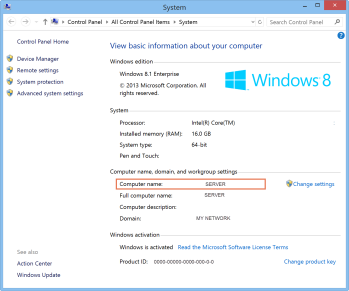 Learn how to set up a new workstation name now. 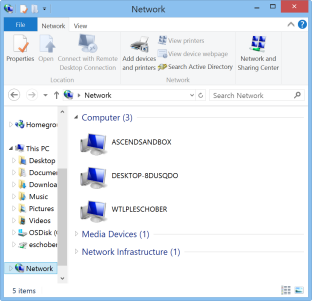 Q: How do I get to the Network and Sharing Center on my computer? A: Click the start menu on your computer and start typing Network and Sharing Center. Select the Network and Sharing Center from the results.